HistoCyte is delighted to announce a partnership with Cell Marque for global distribution of our products. More details can be found in this report. November 2018 > National External Quality Assurance Scheme – Immunocytochemistry and in situ hybridization: Autumn Meeting, London, UK. Dr Ian Milton presented HistoCyte’s work on the Progesterone Receptor Analyte ControlDR. Expanding our Dynamic Range of controls, the Progesterone Receptor cell lines were developed to have cells of varying performance in order to enable the end user to have confidence in their assay results. Ian expanded on the use of anti-progesterone receptor antibodies, their performance and the general use of controls, as well the development of this product. He also briefly discussed other Dynamic Range products and what is in the product development pipeline. The talk was well received with active discussion afterward regarding several subjects. These included the use of cells in combination with in-house tissue as part of the NEQAS submissions for the scheme and how top marks are achievable using them in combination, whereas cells alone (properly working) will only give you 3/5. NEQAS need to see the quality of the tissue produced by the participating laboratory and how it performs immunohistochemically. There were further questions around cells for use in cytology, something HistoCyte are aware of as a utility but as yet do not know the needs of the wider market. 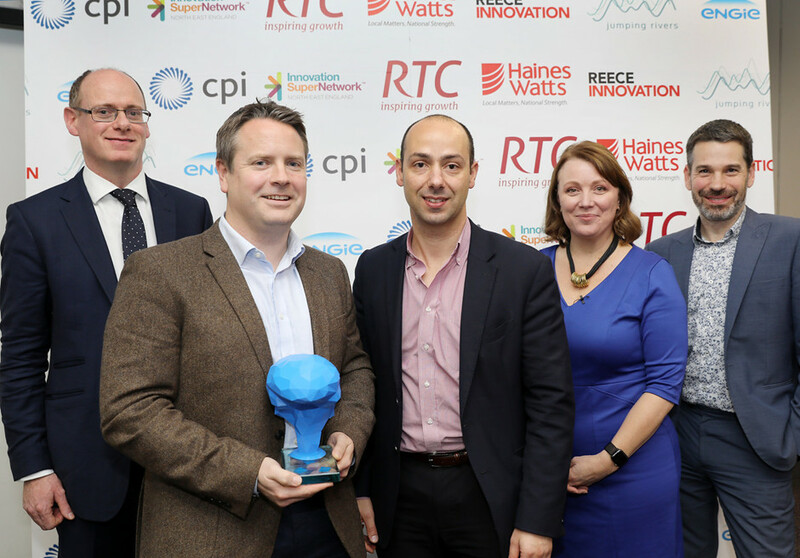 November 2018 saw the North East Innovation SuperNetwork recognise companies across the region for innovating in their respective markets. We are delighted to announce that we won the category for innovation in healthcare. The meeting itself saw many companies presenting on their new products and initiatives as well as describing the journey they took on their way to success. We understand how difficult this journey can be so are delighted to receive recognition for our efforts. Initially shortlisted as one of five, HistoCyte went on to win the category for Innovation in Healthcare due to our development of novel cell line based controls in research and diagnostics and the subsequent commercialisation that has seen us generate interest around the world. Self-funded, HistoCyte has relied on the ability of the team in-house to develop and perfect the technology. Having spent 20-30 years in this market, we had the right contacts and network to facilitate the commercial phase. Knowing the market and having excellent relationships with our customers, combined with the technical aptitude we have developed in-house, has meant we have produced product of high quality that meets the customer’s needs on every level. Colin Tristram received the award on behalf of the team at the meeting held in St James’ Park, Newcastle upon Tyne. We have completed our Dynamic Range of breast markers with the Progesterone Receptor Analyte ControlDR. This product contains four cores, offering a range of expression for PR: negative, low/intermediate, intermediate/high, and high. The low/intermediate (cell line B) and intermediate/high (cell line C) provide a suitable array of cells with varying expression that easily demonstrate whether the assay is running at a suitable sensitivity in your laboratory. Reproducible, robust and cost effective, these are another great addition to the quality control of IHC. For more information, please contact info@histocyte. Continuing our expansion of breast biomarkers, we have released a new Estrogen Receptor Dynamic Range Analyte Control with improved sensitivity. Containing four cores including low and mid expressing cell lines rather than just negative and high, this new ER control is ideal for those wanting increased sensitivity. This cost-effective control is supplied in blocks and slides and is perfect for same-slide use so that increased confidence in results can be achieved by all laboratories. As we look to strengthen our product range for quality control in breast cancer testing, we are pleased to announce the launch of a specific HER2 Dynamic Range Analyte Control. In addition to negative, 1+ and 3+ expressing cell lines, this new product includes a 2+ cell line that is equivocal by FISH. By providing this cost-effective material with improved sensitivity it will confer greater confidence in HER2 IHC and ISH assays when used on the same slide. For any enquiries, please contact info@histocyte. This month we turn our attention to our HPV/p16 products and we have adapted a presentation from earlier in the year that provides an analysis of the current situation. These products were born from a collaboration with Dr Max Robinson, a Senior lecturer in Oral Pathology at Newcastle University and Keith Miller from UKNEQAS-ICC & ISH. In clinical trials the volume of control material for same slide use is excessive and therefore not consistent across all the tests considering the number of samples assessed. An inexhaustible supply of standardised material was extremely beneficial in this case. For external quality assurance assessments, while interpretation on tissue is important, standardised material to determine the technical aspects is vital. Of course the material lends itself to routine use being a cost-effective control for same slide use as previously described. 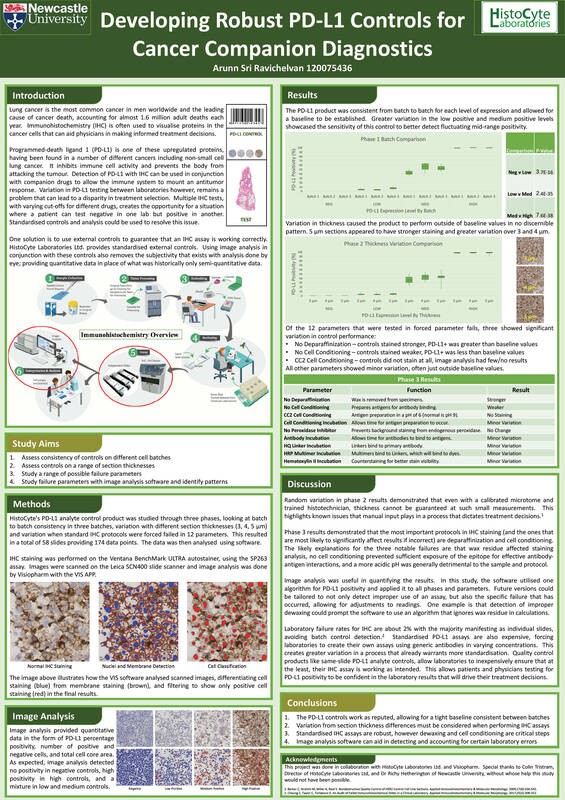 In this summary we provide some background to the product, the diseases and how the use of our control material can improve confidence in HPV in situ hybridisation and p16 immunohistochemistry results. It also details the results and findings of a ring study where we demonstrate the effectiveness across a number of sites. If you would like more information, please contact info@histocyte. It is great to have our products for PD-L1 recognised by Members of the Pulmonary Pathology Society in their recent publication: Archives of Pathology & Laboratory Medicine Journal (Thunnissen et al.). This comes on the back of being mentioned in the International Association for the Study of Lung Cancer publication: IASLC Atlas of PD-L1 Immunohistochemistry Testing in Lung Cancer. As we have an extended range of control material for lung including ALK and ROS1, we hope to see more publications over the next 12 months. We are looking to launch Dynamic Ranges for both ALK and ROS1 over the next year too. As interest in our PD-L1 Analyte ControlDR product has increased since its launch, HistoCyte Laboratories Ltd has embarked on a number of collaborations. We recently concluded a study between ourselves and image analysis experts Visiopharm. This was conducted by a medical student seconded to our laboratories. Arunn Sri Ravichelvan looked at what “failed” immunohistochemistry (IHC) tests with the cells looked like by image analysis. He did this by creating a baseline reading from standard IHC runs. He was then able to compare the following to this baseline: section thickness, inappropriate epitope retrieval, incubation times and antibody concentration. A pdf of the poster can be found here. With additional data from other groups we will look to include this data in a future publication. This current data demonstrated how stable the product is across three independent batches of product. In addition to being a good quality control tool it could potentially help in troubleshooting a failed test. We wish Arunn all the best for his future studies. At the NordiQC meeting in Aalborg, HistoCyte laboratories Ltd were invited to present as one of the sponsoring companies. Dr Ian Milton talked about one of our leading works in R&D: ALK Analyte ControlDR. While HistoCyte Laboratories currently have two products for ALK in Lung and Lymphoma, we know from experiences with our customers and from working closely with various external quality assurance (EQA) schemes that some still struggle with their assay optimisation and appropriate sensitivity for the specific ALK translocation, or more specifically the resulting fusion protein. In this presentation, Dr Milton discussed the combination of cells containing EML4-ALK (associated with non-small cell lung carcinoma), NPM-ALK (associated with anaplastic large cell lymphoma), Wt ALK and a negative control. This combination clearly demonstrates the appropriate sensitivity of the ALK assays. This product is expected to be launched in early 2018. For any enquiries, please contact info@histocyte. Further expanding our lung panel, the new ROS1 Analyte Control is now available from HistoCyte Laboratories. Visit the ROS1 product page for more information. We are delighted that our commitment to working to the highest standard has been recognised with our certification for EN ISO 13485:2016. Our Quality Management System allows us to provide high quality solutions to pharma and biotech and we also have the capacity to develop our own products with IVD status as required. A copy of our certificate can be found here. 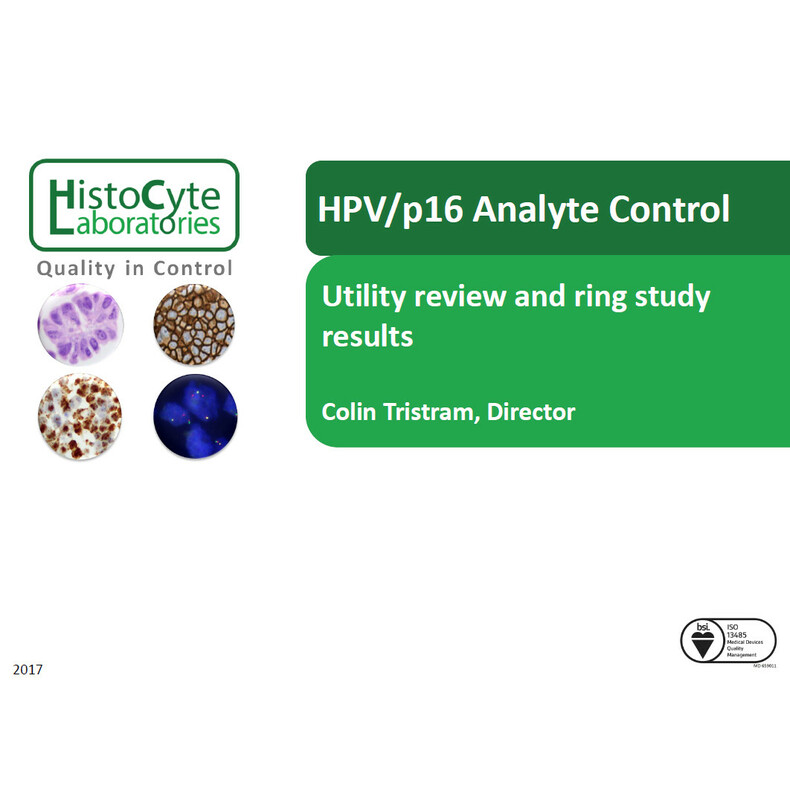 Dec 2016 > HistoCyte Laboratories HPV/p16 Analyte ControlDR recognised in recent publication regarding the use same slide controls in HPV and p16 assays. HistoCyte Laboratories Ltd's first product came through a collaboration with the Dr Max Robinson at the Royal Victoria Infirmary, Newcastle upon Tyne. A Senior Lecturer in Oral Pathology at Newcastle University, Dr Robinson required reliable control material for his work, in particular his clinical trials. This collaboration gave rise to the HPV Analyte ControlDR which with Dr Robinson’s help was extensively tested by IHC for p16 and ISH for E6/E7 mRNA and HPV DNA. Dr Robinson has written a chapter in HPV Infection in Head and Neck Cancer, Recent Results in Cancer Research, Volume 206, Springer 2106, pages 101 to 111, in which he provides a review of current testing of HPV in head and neck cancer in clinical practice. As part of his review he discusses the need for standardised controls and refers to the HistoCyte Laboratories Ltd products as one means to meet these requirements. It has been a pleasure working with Dr Robinson on this project and we look forward to future projects. HistoCyte is pleased to announce the release of our PD-L1 control material. Offering a dynamic range of expression for PD-L1 and multiple formats to suit your workflow, contact sales@histocyte for purchase enquiries. HistoCyte Laboratories is delighted to report that our entire product range is now available in Germany through Medac. Medac has a wide reach throughout Germany, supplying products to private practice, hospital laboratories, pharmaceutical and biotech companies, and research institutes. With our wealth of experience in the design and development of antibodies, probes and assays for IVD tissue-based diagnostics, we can now offer clients a range of contract services to assist in the development and commercialisation of their products. See the services section for examples of how we could help. The efficient processes we apply in manufacturing and our commitment to ensure our customers receive the highest quality product have been recognised in the form of ISO9001 accreditation from BSI. The NPM-ALK control contains 2 cores that offer positive and negative expression for the biomarker, available as slides or blocks. View our products page for more information. We have released a multi-purpose block for use with Her-2, ER and PR. The product is available in a 5-core format that offers a full dynamic range of expression for the 3 biomarkers, or a 2-core format that offers positive and negative control. As with all of our analyte controls, these can be purchased as pre-cut slides or as blocks to suit your workflow. View our products page for more information. We have received SMART Award funding for a Proof of Market study to carry out market analysis as we look to expand our product range. Our ALK control contains two cell lines that demonstrate positive and negative expression of EML4-ALK. There are two formats available: control slides [HCL007](x2)[HCL008](x5) and control blocks [HCL009]. Each have their merit depending on the needs of the laboratory. The slides offer ease of use and save time in preparation. However, in high volume centers the blocks provide approximately 300 sections to offer a more cost effective solution and fit into the workflow of the laboratory easily. In either case the analyte controls demonstrate that the reagents employed to perform the assay have worked effectively in combination with the staining protocol. Please visit our products page for more information. May 2015 > HistoCyte Laboratories is Expanding! After the release of our first product and the positive reception it has received, we turned our attention toward developing analyte controls for assays that we have identified a clinical need for. With two more product lines approaching commercialization and the uptake we are seeing with our HPV analyte controls around the world, we decided it was necessary to expand. As a result of this we have moved to a larger laboratory that offers a superior workflow and more efficient processing. Combined with the addition of some new equipment that allows us to bring more processes in-house, we believe we have the necessary means to meet the type of demand we expect when our next products come to market. If you have an unmet need in your laboratory or require a contract service please feel free to contact us. Our list of distributors throughout Europe is expanding. HistoCyte products are now available to purchase from Immuno Diagnostic Oy in Finland and Biosystems Switzerland AG. If you are interested in distributing our products then please contact us at info@histocyte.com. In today’s cellular pathology service laboratories there is an ever increasing pressure to obtain more information from biopsies and the smaller resection samples generally provided for tissue diagnostics. This, combined with the ongoing demand for improving the quality of service, means that a suitable, high quality control material is imperative to a timely and correct diagnosis. The cost of finding this material from tissue banks and archives is often not fully appreciated. Moreover, for rare biomarkers or semi-quantitative assays, the demand for tissues with appropriate expression levels often exceeds the supply. UKNEQAS (the United Kingdom National External Quality Assurance Scheme for ICC and ISH) assessments have often noted that internal control tissue being used routinely in subscribing laboratories is inappropriate or incomplete. The lack of availability of suitable control tissue means a laboratory may only have some of the tissue required to demonstrate the necessary expression levels of a given biomarker optimally. This finding highlights an increasing need for standardised control material for IHC and ISH testing, which in turn introduces the challenge of providing a cost effective solution that can be applied to every case tested. This requirement for standardised, reproducible control material of suitable protein expression was the reason that UKNEQAS originally investigated the use of cell lines for their Her2 assessment modules.1 This work was further developed in Newcastle upon Tyne and made robust on an industrial scale at Leica Biosystems Ltd. These cell lines were validated in a number of ways and jointly described in further work.2 Since then UKNEQAS has investigated a number of other areas where cell lines can be used as high quality control material, such as estrogen and progesterone receptor (ER and PR) assessment and, more recently, with ALK. HistoCyte Laboratories Ltd builds on a track record in the IHC and ISH field. They are developing high quality analyte controls aimed at some of the more demanding assays that laboratories perform on a daily basis. These cell line control products remove the burden of locating, characterising and managing banks of precious control material and also avoid any ethical issues surrounding the use of patient material as controls. The adoption of well characterised, inexhaustible control material also means the introduction to the market of a universally accepted standard. This will bring about an increase in the quality of laboratory practice generally, which can only be a good thing. I am very excited by what HistoCyte Laboratories Ltd will bring to this field and look forward to collaborating with Ian Milton and Colin Tristram as I have done in their previous enterprises. UKNEQAS works closely with industry partners in order to deliver high quality solutions to our colleagues in laboratories throughout the UK and beyond. Only through collaborating with the industry can we ensure that our needs are met and ultimately make sure quality services are delivered to the patient. Keith Miller has worked in the field of immunohistochemistry for over 30 years. He was previously the Technical Head of UCL-Advanced Diagnostics (formerly known as the UCL Immunocytochemistry Unit) since 1982. As Director of the UKNEQAS-ICC&ISH since 1992, Keith has recently helped establish an independent “not for profit” laboratory service Cancer Diagnostic Quality Assurance Services, Community Interest Company (CADQAS CIC) for UKNEQAS in order to support both the scheme and the tissue diagnostics community, including those in the commercial sector such as HistoCyte Laboratories Ltd.
1Rhodes, A., Jasani, B., Couturier, J., McKinley, M. J., Morgan, J. M., Dodson, A. R., Navabi, H., Miller, K. D. and Balaton, A. J. A formalin fixed, paraffin processed cell line standard for quality control of immunohistochemical assay of HER-2/neu expression in breast cancer. American Journal of Clinical Pathology, 2002. 117. pp. 81-89. 2Bogen SA, Vani K, McGraw B, Federico V, Habib I, Zeheb R, Luther E, Tristram C, Sompuram SR. Experimental validation of peptide immunohistochemistry controls. Appl Immunohistochem Mol Morphol. 2009 May;17(3):239-46. RNAscope is an RNA in situ hybridization (ISH) method that enables routine detection of genes in formalin-fixed paraffin-embedded (FFPE) tissue. It enables as much as 400-fold enhancement in signal-to-noise ratio, making it one of the most sensitive RNA ISH methods available. Advanced Cell Diagnostics Inc. have developed a HPV assay to the high risk types. The results here confirm HistoCyte’s HPV-CMA utility in IHC, DNA ISH and now RNA ISH.